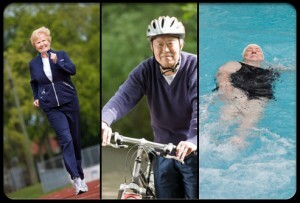 To Age Healthfully, Keep Moving! One of the most common New Year’s resolutions made by people of all ages is to exercise more regularly. Fitness is crucially important at all stages of life, but is even more critical as we age. Regular exercise – even light or moderate exercise – helps to fight off atrophying muscles and build the most important muscle of all: the heart. As reported in the Seattle Post-Intelligencer, a recent study out of Sweden found that a generally active lifestyle, even without regular exercise and fitness sessions, promotes heart health and longevity. The study found that “background activity” – the usual exercise, wear and tear your body undergoes as you go about your day – has too often been disregarded or underestimated in clinical studies of the importance of exercise and physical fitness in older people. Researchers found that whether you exercise regularly or run errands all day doesn’t make as much of a difference to your health and longevity as avoiding long periods of sitting near-motionlessly, like when watching television, reading, or working on the computer. An excessively sedentary lifestyle is the link between aging poorly, both physically and mentally. Sitting is so detrimental because it prevents muscles from contracting and causes decreased blood flow, which allows muscles to atrophy and reduces the efficiency of many body functions, including nutrient absorption. Together, all these issues can put you at greater risk of falls. Even moderate exercise, like walking up stairs, cleaning the house, or carrying grocery bags across a parking lot can have a positive impact on muscle and heart health. The good news, though, is that the study found that increasing one’s activity level can happen at any stage, so if you’re living a mostly-sedentary life right now, all you have to do to immediately begin improving your health is to get up and get moving. Whether it’s just a wander around your home, or one of the other activities we’ve suggested before, now is as good a time as any to get the blood flowing, the heart pumping, and your body moving towards a healthier, more active future. Just be sure to consult your doctor before you begin any new fitness routine.